Thousands of visitors stop in Metter, Georgia each year thanks to the convenience of Exit 104 on I-16. A number of fuel, dining and lodging options are right at the exit, as is the Metter Welcome Center, housed in the old 1928 Lumber Commissary, which is open Mon-Fri, 9 a.m.-5 p.m., Sat, 11 a.m.-5 p.m., and Sun, 12-5 p.m.; call 912-685-2159. Beyond the interstate, Metter and Candler County have numerous attractions, including the spectacular Guido Gardens, the intriguing Candler County Museum, and all the outdoor adventures found at George L. Smith State Park, Beaver Creek Plantation and Willow Lake Golf Club. 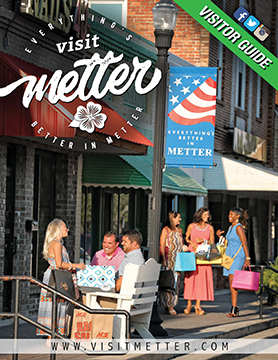 Downtown Metter and its historic districts encourage you to imagine life in a more genteel age, and is a perfect stop for lunch or finding the perfect gift. Or you can explore the backroads of Candler County, Georgia, taking in the picturesque views and fresh air of our rural community.